A solar wind stream flowing from the indicated coronal hole could reach Earth on Nov. 22nd or 23rd. Credit: SDO/AIA. ON SALE NOW: The David H. Levy Comet Hunter -- offering the clearest views of Comet Hartley 2. COMET SNOWSTORM ENGULFS HARTLEY 2: Researchers have released new and beautiful photos of an unprecedented snowstorm raging around Comet Hartley 2. "We've never seen anything like it," says science team leader Michael A'Hearn of the University of Maryland. Get the full story from Science@NASA. The Moon is full on Nov. 21st. Usually there are only three full Moons in a season, but this Fall there will be four. The full Moon of Nov. 21st is the third of those four. According to old editions of the Maine Farmer’s Almanac, that makes it a Blue Moon. Confused? No wonder the modern definition is so much simpler. "We have bad weather forecast for the 21st," says De Rosa, "so I took my old-fashioned Blue Moon photo on the 19th instead. 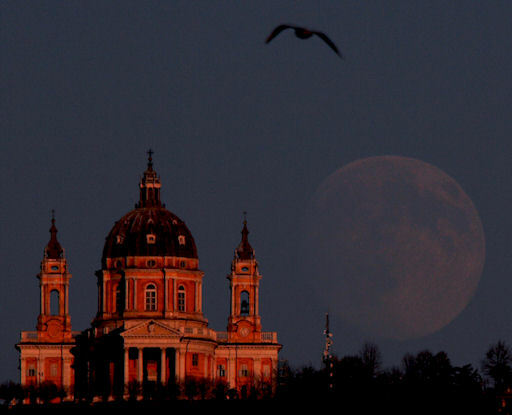 It might not be truly blue, but the Moon looked great anyway rising alongside the Superga church while another wonder from the sky was joining the scene!" Readers, be alert on Sunday night for a Blue Moon of your own. 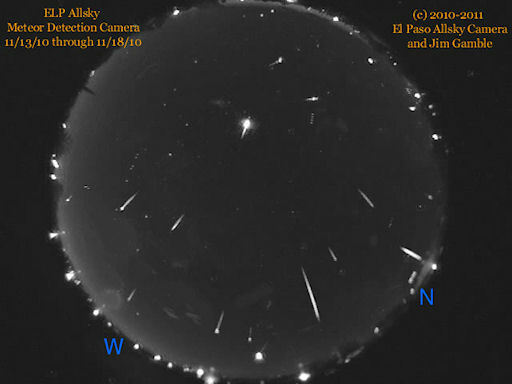 "These are all the Leonid fireballs I recorded from Nov. 13th to Nov. 18th," says Jim Gamble, who operates an all-sky camera in El Paso, Texas. "In total, there were 16 Leonids of magnitude -3 or brighter." Considering that Earth missed the densest part of the Leonid debris stream in 2010, more than a dozen fireballs is a good haul. A bigger display is coming: In early December, Earth will enter a cloud of debris from extinct comet Phaethon, setting off the annual Geminid meteor shower. On peak night, Dec. 14th, forecasters expect as many as 100 meteors per hour, five times greater than the waning Leonids. Stay tuned! On November 20, 2010 there were 1164 potentially hazardous asteroids.